A second-half header from visiting captain Lee Kilday was enough to condemn Raith to a sixth straight League defeat, as the Rovers fell further into the bottom-half of the Scottish League Championship table. Despite several half-chances, Raith couldn’t generate sufficient momentum to trouble Morton, with the Cappielow side taking all three points from this poor-quality encounter. As an unhappy post-script, the match drew a line under Gary Locke and Darren Jackson’s spell as management team at Starks Park. While the defeat was by a single goal, the Board moved swiftly after the final whistle, the announcement being made public on the club’s website as many fans would have been arriving home after this latest disappointing result. With a week’s break before the next League outing, Raith have a chance to clear heads and take a deep breath before what will be a testing close to this season’s campaign. After the recent defeats at the hands of Dumbarton and Dundee United, Locke had rung the changes. Both strikers were replaced, with Stevenson and Hardie given a chance to blend upfront. Craig Barr made a welcome return to the defence, in his first start since returning from a lengthy injury lay-off – Kevin McHattie, who’d missed only one League game this season prior to tonight, was dropped to the bench. Jordan Thompson was also given a run, starting in place of Ross Matthews. Conor Brennan deputised for the injured Kevin Cuthbert in goal, following some encouraging saves against Dundee United. Morton also freshened up a line-up which had seen a seven-match unbeaten run brought abruptly to a halt at Palmerston on Saturday in an unceremonious 3-0 defeat. Ross Forbes was unable to recover from a dead-leg sustained on Saturday, Lee Kilday was reintroduced as captain, and Michael Tidser started at the expense of Aiden Nesbitt. Celtic loanee Luke Donnelly went straight into the starting XI. With Morton having scored 33 goals to Raith’s 22 this season, Forbes’ injury was perhaps a welcome boost to a beleaguered home defence. Morton remained without long-term injury absentees Jay Quitongo, Conor Pepper and Kudus Oyenuga. With the heavy rain lightening at kick-off, the teams began the match in combative spirit. The midfield was keenly contested, with frequent fouls and breaks in play. It was eight minutes before a strike on goal – Russell having drawn a foul from Thomson, Brennan showed good hands to hold a swerving free-kick from Lindsay. Craig Barr began well. Penalised for an early climb to meet an inswinging corner from his namesake Bobby Barr, Craig looked strong under the high ball. Fitting in alongside M’Voto with Benedictus starting at left-back, Barr showed a sureness of touch on the wet surface that belied his long absence from first-team football – constantly barking instructions to team-mates, the young defender gave every indication of never having been away. 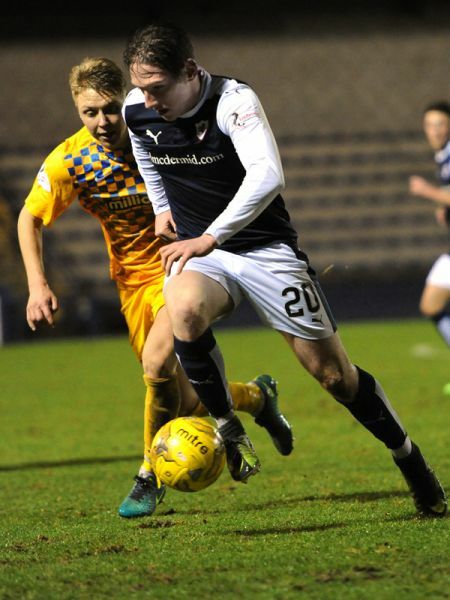 His award as Man-of-the-Match was a bright spot on an otherwise bleak night for Raith fans. The opening stages saw Shankland, Lindsay, and Donnelly all seek to run into space. Interchanging well, the Morton front-line ran diagonals at a brisk pace, but were matched by their opposite numbers as numerous passes zipped across the wet turf. Reasonably fluid from middle to front, Morton looked fresh in the initial exchanges. On twenty-three minutes, a glorious chance for Raith to open the scoring – with time to set himself from distance, Callachan drove a rasper at Gaston; with the visiting keeper only able to parry, Hardie had two further attempts blocked away. For the first time, the South Stand roared its approval. On the half-hour, a looping McDonagh shot was again well held by Brennan. The visitors’ midfield was keeping the ball well by this stage – following the fragmented opening, Morton had begun to pass the ball with more authority, although Callachan Thompson and Davidson won a share of possession. From one such scrap, Hardie fed Bobby Barr whose shot flew wide. Morton’s Lindsay was finding space more frequently as the half progressed. Spreading the play well, he allowed Donnelly to cross deep, O’Ware’s forward sortie ending with a header over Brennan’s bar. Shortly before the break, a heavy M’Voto touch almost allowed Shankland to run clear – Barr covering well to bundle the ball to safety. 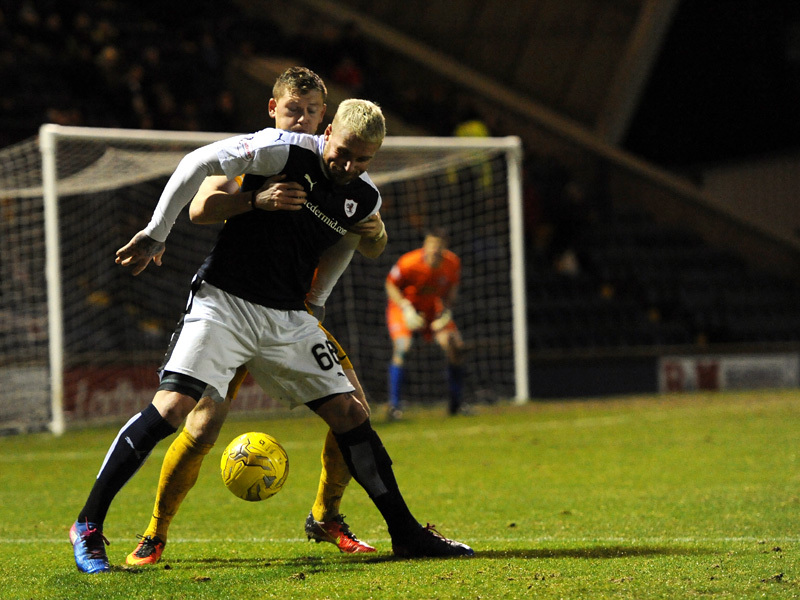 The incident was noteworthy in itself – up to that point, Raith had looked almost resolute in defence. From Brennan to his back four and their covering midfielders, the visitors had been allowed few if any clear-cut chances. An encouraging cheer met the half-time whistle. Raith started the second half brightly. Hardie narrowly failed to connect with Bobby Barr’s cross, Gaston clutching gratefully as the ball bounced right in front on him. Moments later. Stevenson played a lovely ball inside Kilday finding Barr at full pelt – the Morton keeper again grasping the Raith winger’s cross. 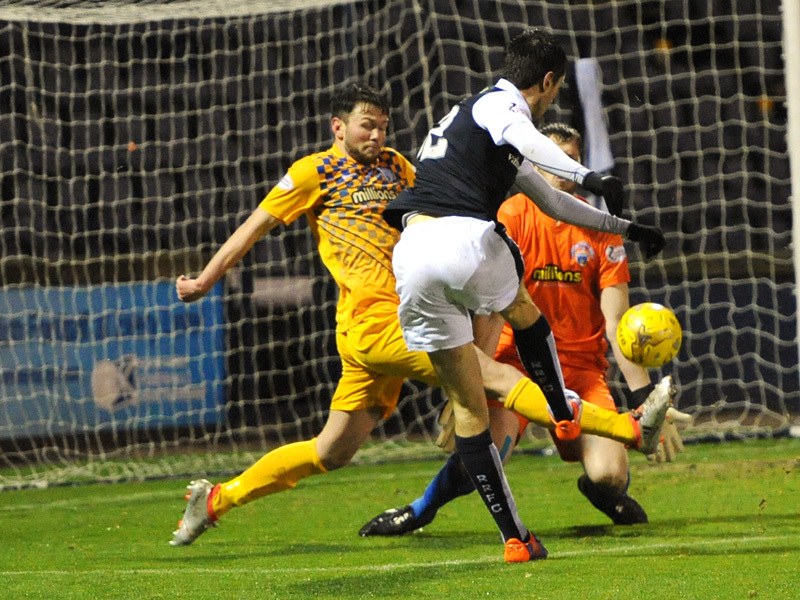 With fifty-two minutes on the clock, a deceptively straightforward goal from Morton, which would turn out to be the difference between the sides at full-time. Tidser’s inswinging free-kick was met by Kilday, whose firm nod was placed just inside Brennan’s post – the vocal travelling support in raptures. Whether Brennan hesitated, or the Morton captain slipped his marker, only those in the thick of it will know – from a supporter’s viewpoint, having defended well in the first forty-five, the goal’s simplicity was a hammer-blow. The next few minutes would be crucial. Raith had lost several goals in quick succession recently, and within moments, a clear chance for a Morton second. Shankland beat Benedictus, and after Tidser had fed Donnelly, the latter’s cross was flicked just wide by Shankland who had sprinted untracked into Brennan’s six-yard box. In response, Callachan’s overhead kick was held by Gaston after Stevenson had created a good platform in front of Lamie, but, in truth, the goal seemed to have changed the flow of the match irreversibly in Morton’s favour. On the hour, a double change for Raith: McManus and Stewart replacing Stevenson and Callachan – the diminutive Stewart joining Hardie upfront, with McManus sitting just behind. Instead, it was Morton who had the next real chance: Craig Barr’s partial clearance from a Tidser cross gave O’Ware time to shoot; the fizzing drive just wide. At the other end, M’Voto’s glancing flick from a set-piece was held by Gaston. Tidser’s free-kick from a central position was taken comfortably by Brennan. 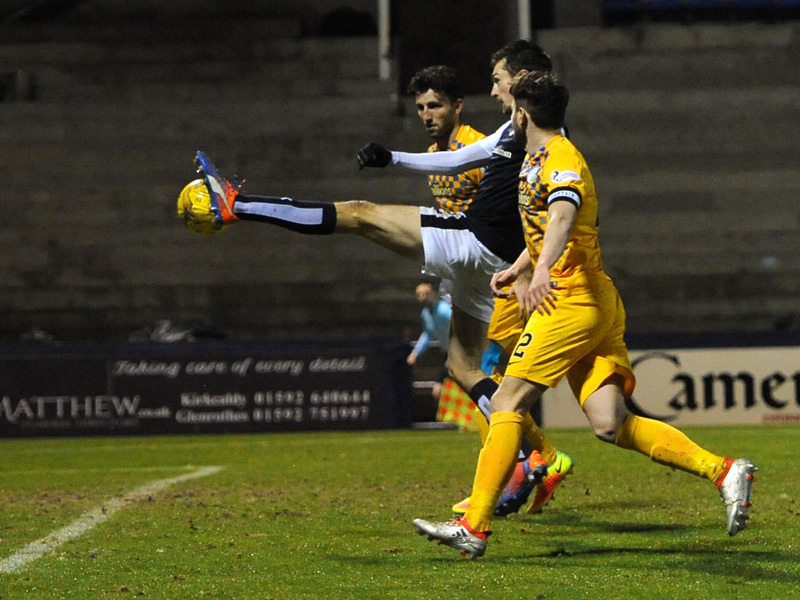 As the match moved into its final twenty minutes, Raith sought to raise the tempo. A bustling run from Benedictus allowed Barr to cross, McManus shooting a bouncing ball wide of goal. A flicked header from Stewart from a driven Thomson cross was gathered by Gaston, the keeper making a meal of a routine save. On seventy-seven minutes, a penalty shout in the Morton box. Thompson jinked past one, but stretching for a further touch seemed to angle his run to draw contact. Referee Duncan looked on, unimpressed, although the South Stand howled in despair. Within a minute, another chance: Thomson’s header back across goal from Barr’s deep cross was met by McManus, who guided his header inches over Gaston’s bar. While Raith carved several half-chances during this spell, Morton looked the better in possession. Tidser and Lindsay exchanged passes well, with Shankland and Donnelly willing runners. Bobby Barr and Davidson were both booked, as Raith’s frustration began to tell. Inside the final ten minutes, having removed Callachan, Locke removed captain Thomson for Rudi Skacel. With Benedictus further forward and Bobby Barr regularly crossing high deep diagonals, Raith poured numbers into the Morton box. Despite the bombardment, Morton’s defence rarely looked troubled under the high ball. Stewart, chasing tirelessly, was always less likely in the air against Morton’s defensive two. The match petered out in an unsatisfactory fashion. With Morton running to the corners, and three successive set-pieces taken solely to protect possession, referee Duncan’s watch reached the ninetieth minute without the siege Raith’s supporters craved. 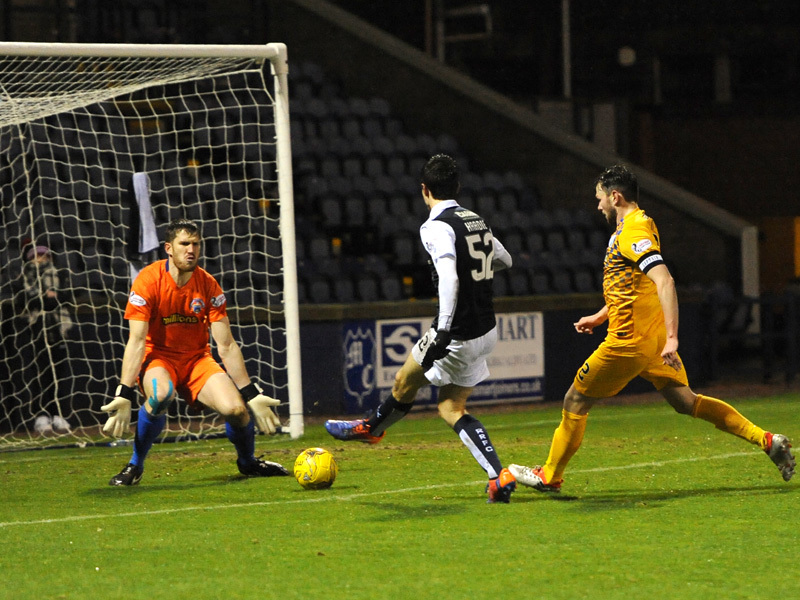 A last heave forward from keeper Brennan came to nothing, despite Raith’s battalions being stationed in and around the Morton eighteen-yard box. In the last ten minutes, as they had done throughout, Lamie and Kilday marshalled their defence, won their headers, and cleared their lines. When the final whistle came, so did the sound of the South Stand’s disappointment. As Morton’s supporters sang and danced into the Kirkcaldy night, Raith’s players and staff headed disconsolately down the Starks Park tunnel. With post-match events at Starks clearly reflecting a desire for a change of direction, the next ten days are crucial in rebuilding shattered confidence before the next critical run of League fixtures. 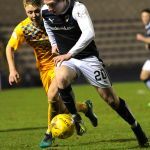 Raith Rovers will be hoping to put some increased distance between themselves and the relegation playoff place this Tuesday evening, when Morton visit Stark’s Park in a rearranged Championship fixture. 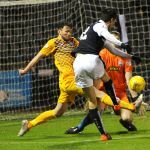 The match was initially scheduled for December, but a postponement of Morton’s Scottish Cup tie against Beith Juniors, and it’s subsequent switch to the following Saturday, meant that the game had to be moved. If Rovers are to win on Tuesday evening, they’ll need to do something which they’ve never managed this season, and that’s score a goal against Jim Duffy’s team. A Ross Forbes free-kick was enough to send the first meeting Morton’s way in October at Cappielow, and the second match-up last month, saw Morton victorious again, this time by a two goal margin, thanks to Forbes again and Lawrence Shankland. This season’s form against Morton is in stark contrast to the last campaign, when Rovers took the maximum 12 points from 12 against Jim Duffy’s team, on their way to securing the final playoff spot. 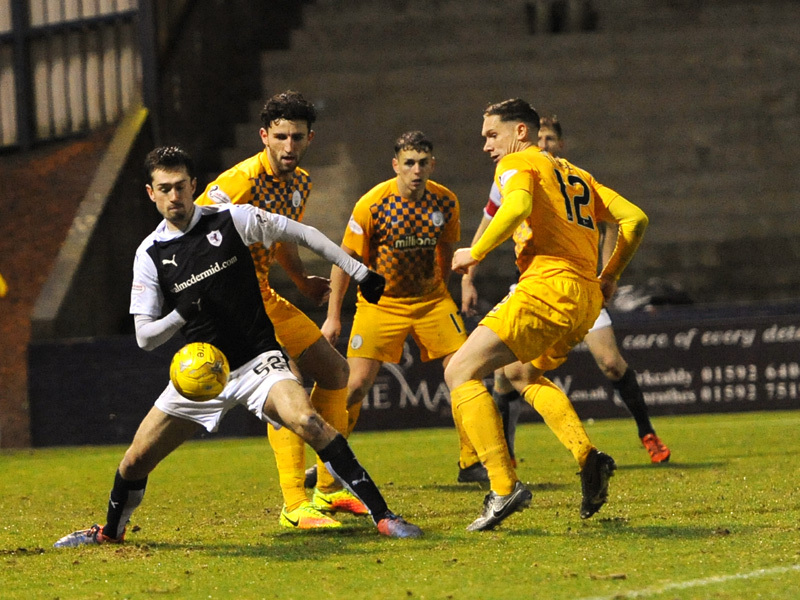 Fourth placed Morton had been in sparkling form in recent weeks, as they gradually closed the gap to second placed Dundee United, with a sequence of seven games unbeaten. However, a heavy 3-0 loss to Queen of the South brought that run to an abrupt end at the weekend, as they moved down the table a notch after being leapfrogged by Falkirk. A win on Tuesday though, would see them move back above Peter Houston’s men, to reside just three points behind United in the table. Rovers have a good head-to-head record against Morton in recent years, with six wins and just two defeats from the last ten meetings. Tuesday night’s match referee will be Gavin Duncan.